May is a month of “M”s - Mother’s Day, Memorial Day and Mental Health Month. We honor our mothers, remember those who gave their lives for our country and hopefully pay attention to our mental health along the way. This month, we also acknowledge National Blood Pressure and Stroke Awareness. Often the stress of motherhood or military service causes our blood pressure to rise, occasionally leading to more serious health problems. See our “Did You Know?” for some helpful links information regarding high blood pressure and stroke. Readers will recall that we met Isaac last month in discussing his faithful work in caregiving for his wife. MonarchCare was appointed guardian for both him and his wife a few months ago. One of the things our Care Manager Brillytza does for Isaac is schedule medical appointments as needs are identified or recommended by his primary care physician. 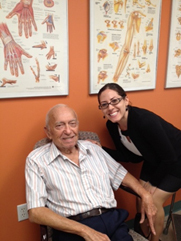 Our new Care Coordinator, Stephanie Setien (see bio below), arranges transportation and Brillytza meets Isaac at the appointment where she identifies his concerns and makes sure they are heard. A big part of being a patient advocate is understanding the doctor and then making sure Isaac understands the doctors’ recommendations and/or any medication changes. Isaac knows we are looking out for his best interest and is very grateful for Brillytza’s support. Volunteer to help us with our next “Connectors’ Coronation“ event, which will be held on September 18th. We are looking for task force members to help plan the festivities. If you are interested in helping please contact Chris Levine. SUDDEN numbness or weakness - especially on one side of the body. FACE: Ask the person to smile. Does the side of the face droop? ARMS: Ask the person to raise both arms. Does the arm drift downwards? TIME: If you observe ANY of these signs, call 9-1-1 immediately! Visit the Heart and Stroke Foundation’s website for more information. Then, if you are looking for a way to make a difference in the lives of the people we serve, join us on June 6th for our annual “Jail and Bail”. We would love your support. Arrest a friend (or jail yourself) and support those we care for – those who have no one else to care for them. 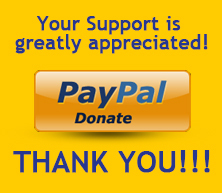 The funds we raise will be used to provide ongoing services to the indigent clients we serve in South Florida. 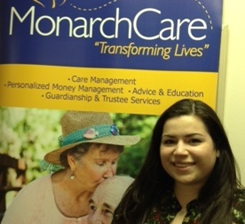 Stephanie just recently joined MonarchCare this April as our part-time care coordinator. She is currently attending Florida International University and expects to graduate with her Bachelor’s Degree in Psychology later this year. 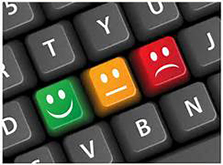 Stephanie has administrative experience in employment staffing and distributing. She also has a strong background in customer service with over three years of experience handling clients in different environments.